Looks a bit bluer than a standard 4100K cool white. Very nice lamp Dave, beautiful! Looks close to EOL also. SWEET! 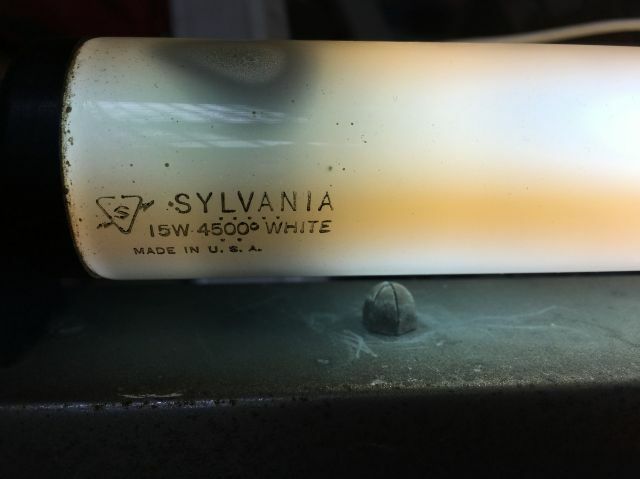 I have a 20 watt Sylvania 4500 white on a fixture in my shop out back, also black bases, and like new. It seldom gets turned on, but I am thinking of fetching it to preserve it. Compared to a inside etch GE F20T12/CW, it is a bit bluer, and I have an old architectural magazine from 1946, that was apparently the year 4500 white was introduced, as it has a short article saying that! There is also a nice GE circline ad and some good fluorescent fixture ads including Smithcraft and Day-Brite. t was at the Edison in with some of my bulbs, so I took it home. It is in my museum trailer at the moment. Frankly, I wish they would bring back the 4500 white! It is nice---not as harsh as 4100-4150K CW, and not as snow white as 5000 white. They are really pleasant lamps, and I would light my shop with them if they were still available. Rick D.
Nice! I love oddball color temps like this between 4100K and 5000K. Looks like it has a lot of hours on it. Made one month before I was born! I got two of the Duro-Test 20w 4500 Whites. Was yours rated at 10,000 hours? Mine are. You had the double cathode model! Two cathodes welded onto the leads. I have a NOS Duro Test F30T8 4500 white. I used my cheating method ( heating of 1 cathode with 6 volts )on a RS fixture. Has GE style ends. Interesting lamp. What's the rated life on yours?